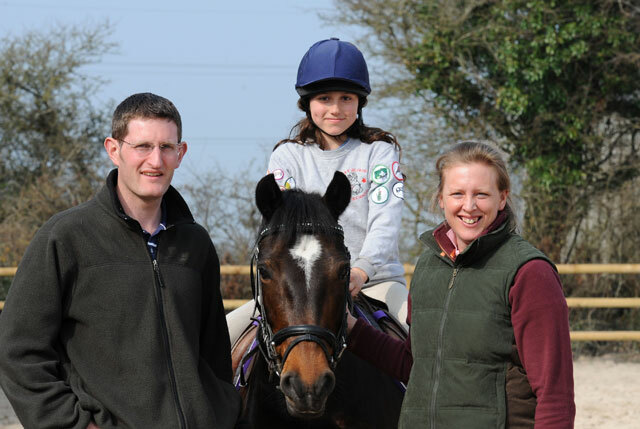 We have a particular interest in seeing young children fulfil their potential and desires by spending time with horses and being taught equestrian skills in a sympathetic and fun way. This is why we were the first riding school in Cornwall to have achieved our Clubmark accreditation and one of only a 40 equestrian establishments in the UK to have been awarded this status. We aim not only to teach riding skills, but also stable management, handling and general care of the horse, an area we believe is often sadly neglected. Our Children’s Saturday Club is extremely popular – for more details click on the link on the left hand side. We have lots of exciting ideas to make riding appealing and fun to children and adults alike, as well as demonstrating the benefits to mental and physical health that spending time with horses can bring. Lisa and Alistair Todd bought Barguse Riding Centre in August 2007. It is situated near the village of Lockengate just a mile from the A30, between Bodmin and St. Austell. Nestled in 26 acres of beautiful Cornish countryside with fantastic facilities, it is home to 28 horses and ponies. Alistair and Lisa’s aim is to expand the business by adding to and improving the existing facilities, so that it provides a fantastic venue for shows, events and lessons that the local community can utilise. We are 20 minutes away from some of the finest beaches in the UK where there is great surfing, magnificent walking and is dog friendly as well as numerous other attractions. Lisa Todd ran a successful livery yard in Ascot, Berkshire for 15 years, training and schooling clients’ horses and providing tuition. Her formative years were spent competing in both affiliated show jumping and eventing competitions before turning her attention solely to dressage. However, she credits learning the German scales of training and the correct use of the seat to well-known German trainer Michael Beining. She has trained and competed to advanced level and currently owns a Dimaggio mare that she enjoys riding when time allows! She is looking forward to developing the riding school and dressage training and welcomes any enquiries that people have. Lisa runs the riding centre on a daily basis, however Alistair does get involved when his equine veterinary skills are required. Alistair has worked for several years in an eight-man entirely equine practice: Scott-Dunn’s Straight Mile Equine Clinic in Berkshire. He worked with horses from all disciplines, racing, polo, dressage, show jumping, eventing, driving, pony club, pleasure horses and rescue centres. Clients included the Queen (Windsor Castle, Buckingham Palace and Hampton Court), Prince Charles, Andrew Balding, Guards Polo Club and others too numerous to mention. He was regularly involved as a racecourse veterinary surgeon at Kempton, Sandown and Epsom as well as attending local point to points, Royal Windsor Horse Show, affiliated BE events, polo matches and pony club events. Alistair is a partner at Kernow Veterinary Group and can usually be seen out & about around the county and at various point to points! However, he does utilise the facilities at Barguse when necessary. Alistair is available for all aspects of equine veterinary work including vettings, dentistry, castrations, lameness work-ups, artificial insemination (AI) etc. We believe that the facilities are here to be used for the benefit of the local community. Wherever possible we try to support local businesses and welcome any enquiries from local businesses.